In honor of an extraordinary Super Bowl, watch BIGHORN, a 15-minute, supernatural historical fantasy about General Custer’s real-life connection to the New England Patriots’ first Super Bowl win, starring Steve Alexander as Custer. See the link to Steve’s book below. Otto Voit was born on February 5, 1845, in Baden, Germany. He was awarded the Medal of Honor for his actions during the hilltop fight, during which he was wounded. Otto Arndt died at The Presidio in San Francisco on February 6, 1917, and was buried in the National Cemetery there. He was on detached service at the Powder River Depot during the battle. William Alexander died in Washington, D.C., on February 6, 1922, and was buried in the Soldiers’ Home National Cemetery there. He was with the pack track and in the hilltop fight. John Duggan, who enlisted in the Seventh Cavalry as John L. Crowley, was born on February 7, 1849, in Fitchfield, Massachusetts. He was a Private in Company L who was killed with Custer’s column. William A. Losee was born in Brewster Station, New York, on February 7, 1852. He was a Private in Company F who was killed with Custer’s column. He was buried on Last Stand Hill, but there is also a memorial marker for him in Brewster, New York. John J. Keller died on February 8, 1913, in Butte, Montana. He was a Private in Company D who participated in the hilltop fight. Benjamin C. Criswell was born in Marshall County, West Virginia, on February 9, 1849. He was awarded the Medal of Honor for his actions during the hilltop fight, during which he was wounded. He died on October 17, 1921, and was buried in the Pleasant Hill Cemetery in Eldorado, Oklahoma. Weston Harrington was born on February 9, 1855, in Alton, Ohio. 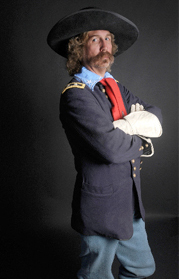 He was a Private in Company L who was killed with Custer’s column. He was buried on Last Stand Hill. William Sadler was born on February 10, 1855, in Frankfurt, Germany. He was a Private in Company D who was on detached service at the time of the battle. He died on November 12, 1921, in Linton, North Dakota, and was buried in the Linton City Cemetery in Bismarck. Stanislas Roy died of cancer at Columbus Barracks, Ohio, on February 10, 1913. He was buried in the Green Lawn Cemetery in Columbus, Ohio. Jeremiah Campbell was born on February 11, 1844, in Sangamon County, Illinois. He was a Sergeant in Company K who participated in the hilltop fight. He died on May 8, 1884, in Decatur, Illnois. Richard B. Dorn was born on February 11, 1853. He was a Private in Company B who was with the pack train and was killed in the hilltop fight. He was buried on Last Stand Hill.